The balance of a room is something we feel more than notice. In contrast, a room that is off balance really stands out. Take a look at the before and after pictures here and notice the two walls of windows. Does anything stand out to you? In the before picture the windows on the left are taller than the windows on the right. It just doesn’t feel right. Now look at the after picture. Yes, we were a little tricky here. We “raised” the windows on the right wall by adding woven wood blinds high above the window frame tricking the eye to think the two walls of windows are level. The soft linen panels were then hung and the balancing act was complete. Tip: Gauzy linen drapes are a great choice for letting light in and softening a room. Pulling furniture out from the walls is another way to balance and ground a tall space. Placing the sofas and chairs in the center of the room not only brings conversations closer but in a room with vast ceilings it also creates weight to pull everything in as a cohesive space. 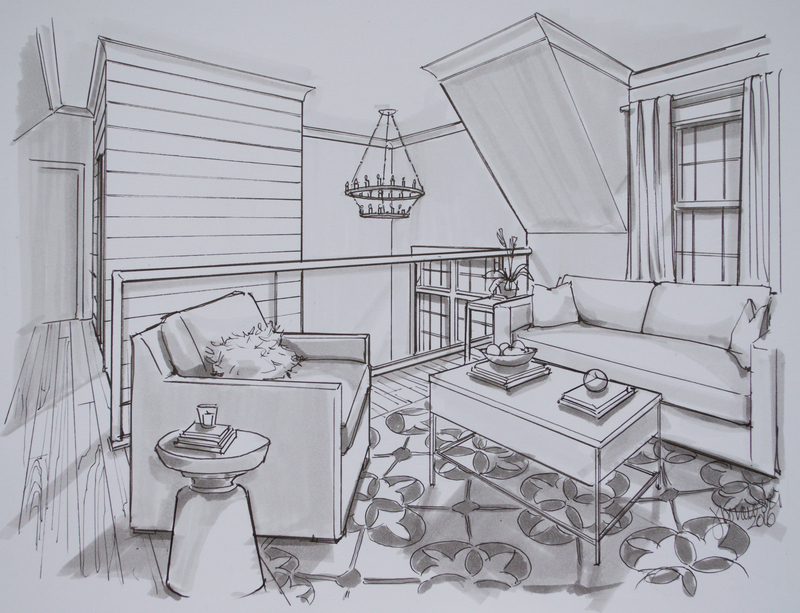 Using white as an accent color has added a modern element to this once traditional room. As you see in the bookcase behind the lamp we wrapped books in white craft paper. This helped to brighten the dark bookcases without having to paint as well as bring a lighter balance to the heavy stone fireplace. Balance is key in how a room feels. Take a look at the varying heights in your space, the furniture placement, and the weight of different textures and colors. Are you living in a balanced home or are there some changes that you can make to bring the balance back? 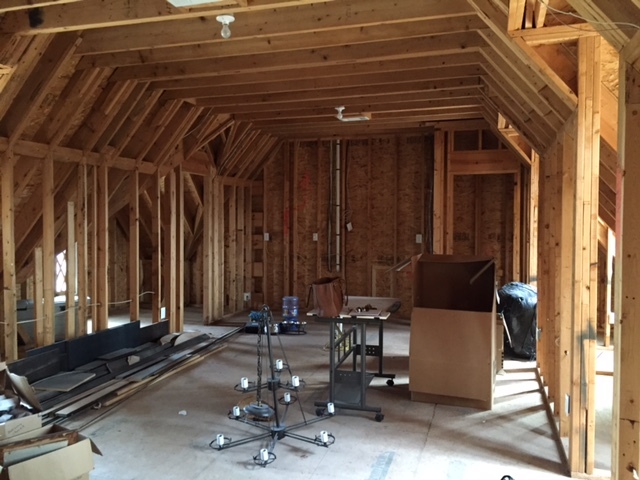 Seeing plywood and studs can be challenging to overcome when envisioning the finished space of a new construction project. 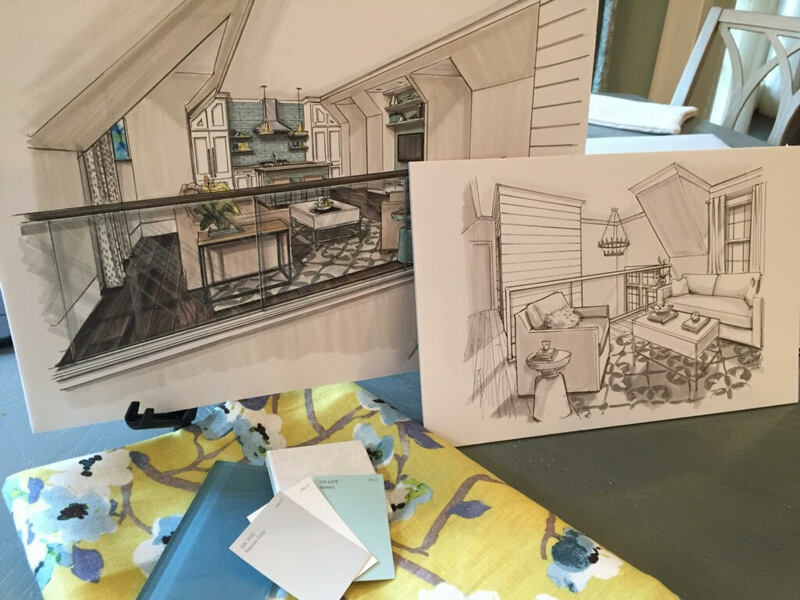 It is beyond helpful to have renderings of the design plan so you can really get a feel for what the end result will be. 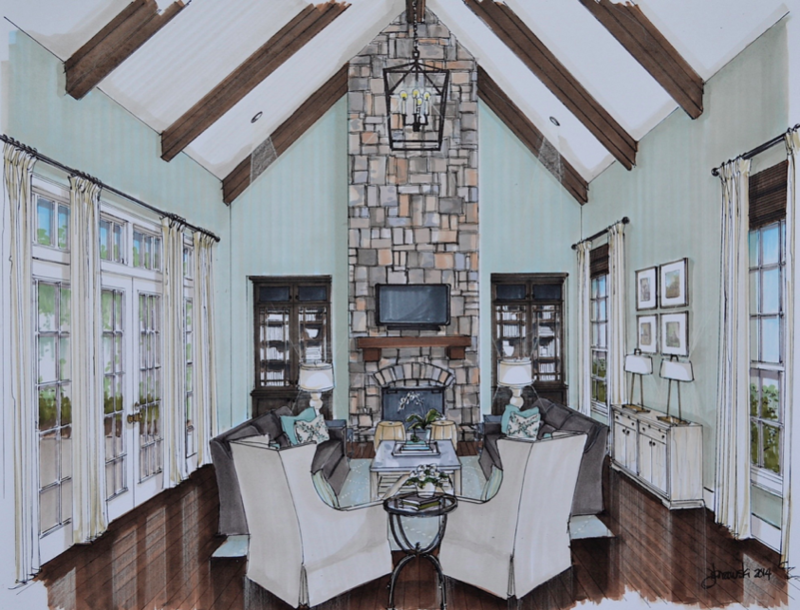 After we met with the contractor and engineer we were able to craft this gorgeous design plan. 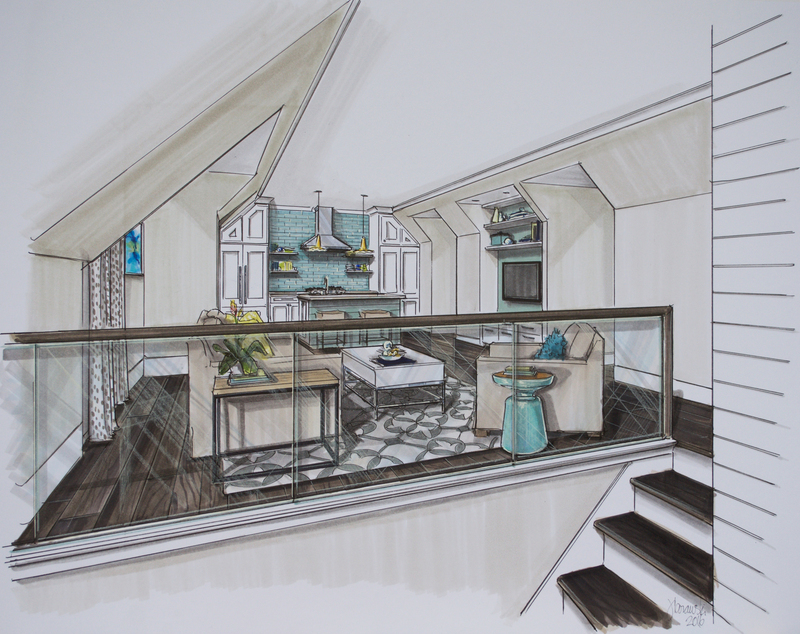 Our client needed a guest home for her mother to enjoy complete with a full kitchen and an elevator. Notice the white ship lap wall. This is the elevator shaft. The horizontal lines of the ship lap adds architectural interest and a focal point on the other end of the room, opposite the kitchen. a glass staircase landing, both for light and to create a more open feel. The front door to the guest house is within a wall of windows bringing light in from the lower level up to the main living area. The furnishings are both beautiful and comfortable. 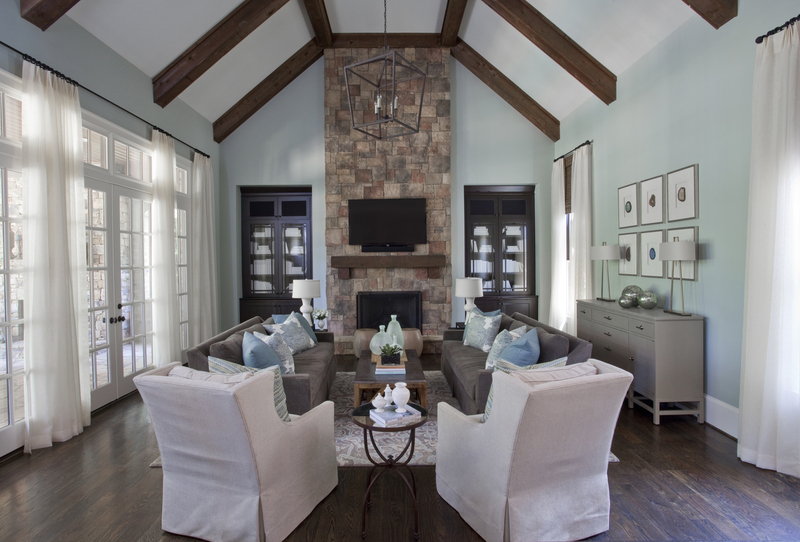 Using a neutral color palate with turquoise throughout, this room has a modern yet classic feel. Glass, metal, and wood elements echo this feel. From studs to stunning this new construction project is well on its way to completion. Stay tuned for the official after pictures soon.